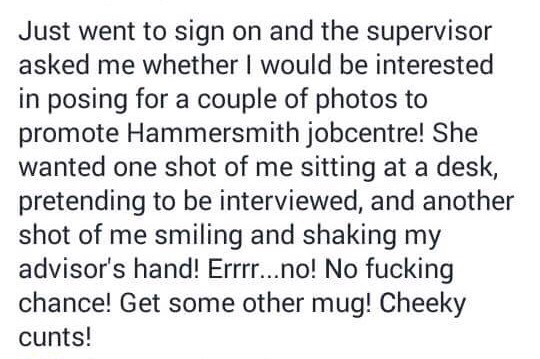 Hammersmith Jobcentre approaching claimants to take photographs for DWP promotional material. 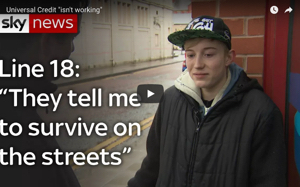 I, amongst others have always had a sneaking suspicion that the DWP likes to approach claimants in their quest to find willing victims for their promotional material. They’ve been caught out in the past when using paid models, so now they are trying it on with claimants. Whenever I see any DWP promotional material, I and others like to research the validity of their photographs and information. Indeed their new Universal Credit promotional material is extremely misleading and inaccurate. So you can imagine my joy at receiving confirmation of their plot to involve claimants. Please note that the person involved is not easily intimidated. I’m sure that a person who is scared and vulnerable would give in to their requests straight away. They might think that if they refuse they could be put at risk of a sanction or worse. Now, it’s extremely rare for a claimant to be actually smiling inside a Jobcentre. You are usually extremely stressed and it’s the last place that you want to be in. And shaking an advisors hand? This very rarely happens, at best claimants are treated like they have the bubonic plague. A decent advisor still won’t shake your hand. Manners don’t really exist in a Jobcentre. It’s just more evidence of the DWP trying to send out a completely misleading message. Kudos to the claimant for sharing this. And watch out for the new fake smiley photos posted in local newspapers and Jobcentres. DWP staff told to reach Aspiration targets. 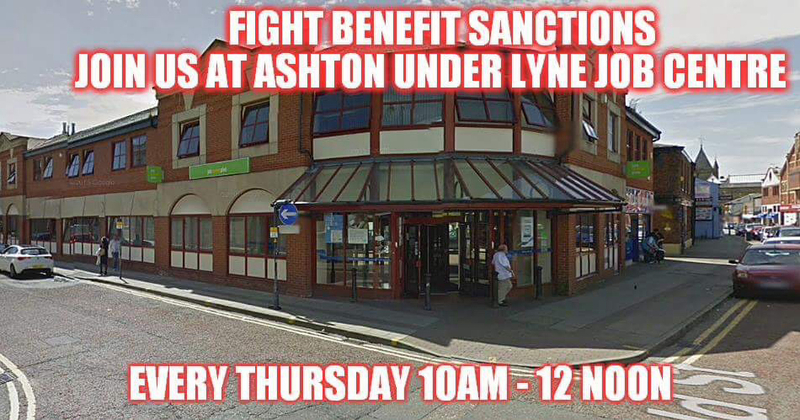 Yesterday’s demonstration outside Ashton Under Lyne Jobcentre. ESA payment delayed and unreasonable local housing association. and all the money problems that went with it. No matter how outrage I would feel, I would Never use language like that! To me it demeans the person and the message they want to put out. There are plenty of expletives to use apart from the “C” word! I am not a snob, I have lived a rough and violent life (from others) but I do have limitations on what language I use. Aside from that, I would ask for their request in writing, so that I could successfully fight it, if I was penalised for refusing and I would also ask for a rather large fee, benefits are Not renumeration! But to be honest that isn’t exactly what they said, it’s what they wrote on Facebook, describing how they felt. I doubt that they said it to their face. “They might think that if they refuse they could be put at risk of a sanction or worse. ” or be given a Jobseeker’s Direction which pretty well means the same. Yes it is but people reading the blog understand sanction or worse.. Jobseekers direction is language used by those in the know. I would have told them yes if you pay me £500 up front and in cash before any photos are taken. Just so they know what up front means. they will say no, problem solved. Hahahahaha that’s a fair deal!